I must be on a tomato kick lately, because I’m sharing ANOTHER fabulous recipe today that features some tasty cherry tomatoes. It must be the summertime-food love getting me, since tomatoes SCREAM summer! 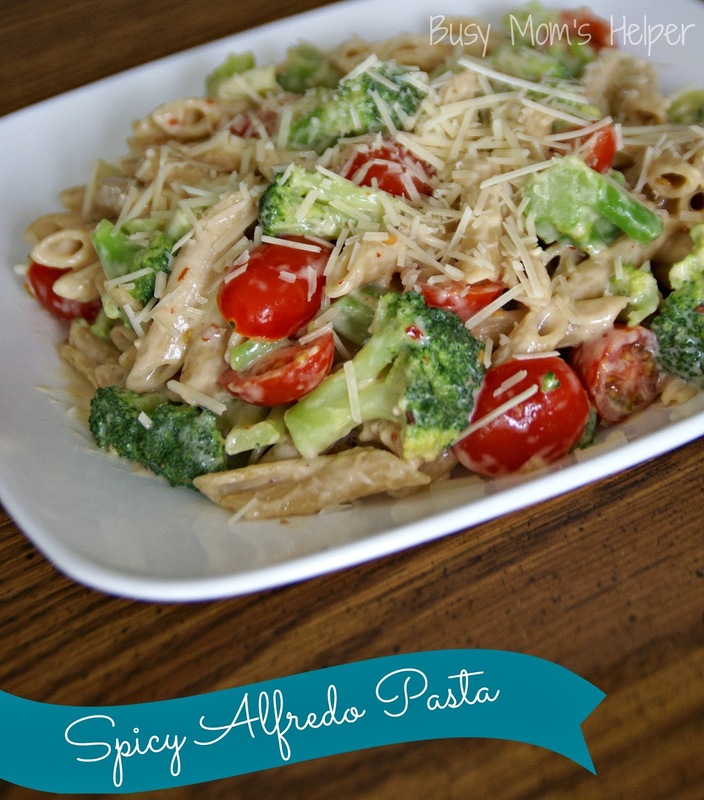 This Spicy Alfredo Pasta is deliciously fresh and summery! I originally used the Alfredo sauce on my Chicken Alfredo Pizza, and it was lick-your-fingers good! As you know, we love pasta, and since I was craving something with Alfredo but with a nice, little ‘kick’ to it, I thought this would be the perfect combo. Tossing in the fresh tomatoes and broccoli really give it some nice texture, and amazing flavor! Of course, I got caught dipping some of the cherry tomatoes in the sauce while making the pasta, so we didn’t end up with AS many in the actual Spicy Alfredo Pasta….but it was too dang good to resist! Yes, my lack of self-control is embarrassing, at times! Meanwhile, in a medium saucepan, melt the Butter over medium heat. Add the Red Pepper Flakes (adjust based on your desired ‘kick’) and minced Garlic, cooking about 1 minute or until fragrant. Mix in the Flour; cook until light tan in color. Mix in the Cream, reduce heat and simmer until thickened, about 2-3 minutes. Add the Parmesan, stirring until melted in, then remove saucepan from heat. Slice the Cherry Tomatoes in half lengthwise. After draining the pasta, add the sauce, tomatoes and broccoli, stirring until well-mixed. Use additional Parmesan cheese for topping, if desired. Enjoy!! !